You've studied the work of Conan, and Khal Drogo. You've got your mighty war horse ready for battle. With your sword in hand you are ready to take a swing at any enemy that comes your way. Not to mention your long dreads are tightly tied back, striking fear into the hearts of all who look upon you. But there's something you're missing. Your warrior pants! 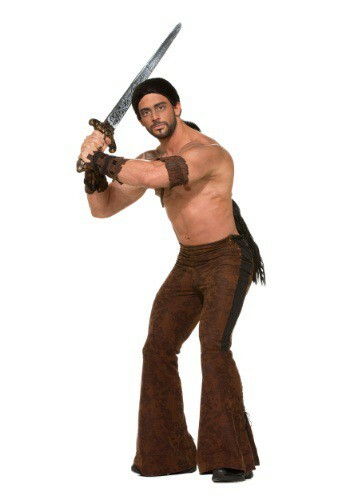 These men's Medieval Warrior pants will make you victorious no matter how perilous the battle. With a design that recreates the look of a barbaric warrior, it gives you a medieval look that is unmatched on the battlefield. Unite your tribe and take your horses across the great plains because there's going to be a lot of spoils to enjoy with you in charge! And if you don't have time to grow your own dreads, don't worry, you can grab some here too.